Online Shop - The Cross Firm P.C. This book is about facing your fears. Yes, facing your fears is what this book is all about. Through our many years participating in the entertainment industry, Paul and I, collectively from our respective positions (Paul as a internationally renowned platinum recording artist) (and myself as a entertainment attorney representing hundreds of singers, mc’s, musical groups, bands, songwriters, composers, musicians, producers, record labels, etc. ), have each witnessed and experienced the tragedy of musically gifted individuals destroyed because they would not face their fears. The main character of our book is named Star. Star is a gifted songwriter, musician, producer and performer. However, underneath his immense talent, Star has a major weakness that he has kept secret from everyone but himself: he is totally afraid and intimidated to deal with any type of paperwork – especially contracts. Despite this secret weakness, as you read through the book, you will see (and learn) how Star forces himself to fight through his intimidation and fear in order to gain a true understanding of the recording contract he has been asked to sign. In fact, you will discover as you work your way through reading the book that Star makes the life changing decision not to ever again consider signing his name to an agreement or contract that he has not read or that he does not understand. Go Getter is another character you will meet in the book. Go Getter is the CEO of an independent record label named Fame Records. Fame Records is the label which is attempting to sign Star to an exclusive recording contract. As you get near the end of the book, however, you will discover that (just like Star), Go Getter knows very little about the contract that he is asking Star to sign with his Record Company, despite the fact it is his company’s contract (this situation happens all the time in the music industry –especially in the independent arena, where neither the artist or the label’s CEO understand the agreement they are signing with one another). So at the end of the story, Go Getter (as a CEO) is also forced to face the fact that his fear of not wanting to deal with contracts has placed his Record Label in a huge dilemma of possibly losing the one artist he has waited a lifetime to work with. In further analyzing Go Getter’s character, one thing we want to emphasize is that this book is not about bashing Independent Record Labels and the passionate individuals who run them. More than any other mechanism in the industry, independent record labels are the engine that drives the music business especially when it comes to discovering new talent and pushing new music. As such, we don’t paint Go Getter out to be the villain or the evil person in the story you are about to read. Instead, we attempt to illustrate that Go Getter, in spite of certain negative aspects of his contract offer, really desires to develop a successful partnership with Star and that he actually believes in Star’s music and wants to spread it far and wide. Okay, so we have provided you with the background themes of the book. As you read, you will immediately notice that the book reads like a story and not like a technical book. We purposely structured the book in this way, because we did not want your reading experience to be that of going through some stuffy technical book about contracts. Instead, we have created a story designed to capture your imagination by bringing in real dynamics so you can live and breathe with the characters as they struggle to map out an understanding of the recording contract and how it will impact their chances of long-term success in the entertainment industry. We also attempt to pull you in to the purposes and strategies behind the contract terms so that you can understand why certain clauses are worded in the way they are and why you have to carefully pick and choose your battles. With the above in mind, read this book. 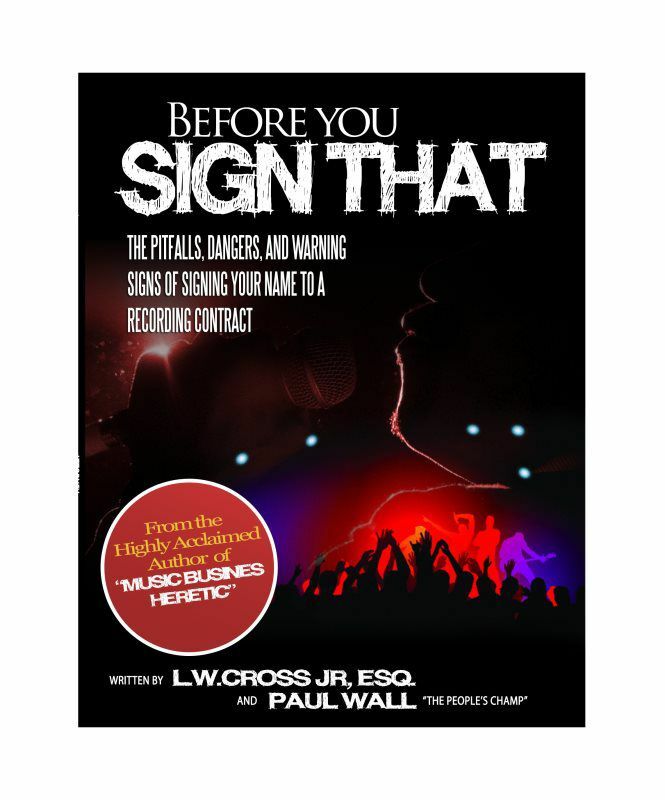 No matter if you are a singer, an mc, or member of a band/musical group, or a musician, or a songwriter/composer, or a producer, or a manager, or a DJ, or a CEO, reading this book will help you overcome any fear you may have with regard to understanding recording contracts. Further, after finishing this book, you will realize how important it is not to sign your name to any document you don’t understand.